I don’t mean to write off Chicago, and certainly not New York. Nor do I truly intend to demean the Ducks or the Lightning. But could anything say hockey LESS than Anaheim, California, facing Tampa, Florida, for the Stanley Cup … in June!?! It would be a kick in the teeth for Canadian fans who await our country’s first NHL championship in 22 years and counting. Hell will have truly frozen over. Well, OK, maybe not. But when Montreal last won the Stanley Cup in 1993, it marked the eighth time in ten seasons that a Canadian team had won the title. Canadian teams were outnumbered by Americans at least two to one during the 50 seasons from 1944 through 1993, but Montreal, Toronto, Edmonton and Calgary still took home the Stanley Cup 35 times! Why the sudden change? Well, at this time hockey had two major leagues: the National Hockey Association (forerunner of the NHL) and the Pacific Coast Hockey Association. Like the NHL and the WHA many years later, players would pit owners against each other, jumping from league to league and driving up salaries. But with the NHA continually breaking its agreements with the PCHA, there was a very real chance that the Stanley Cup would be scrapped. Declaring that the PCHA’s American franchises could compete for the Cup was a way to help keep the peace. In 1916, the Portland (Oregon) Rosebuds became the first American team to play in a Stanley Cup series. They were beaten by the Montreal Canadiens. A year later, the Seattle Metropolitans defeated Montreal, and the Stanley Cup went south of the border for the very first time. The NHL replaced the NHA in 1917-18, but didn’t expand southward until the 1924-25 season when the addition of the Boston Bruins (as well as the Montreal Maroons) saw the league grow from four teams to six. By the 1926-27 season, the NHL had grown to ten clubs with six of them based in the United States. 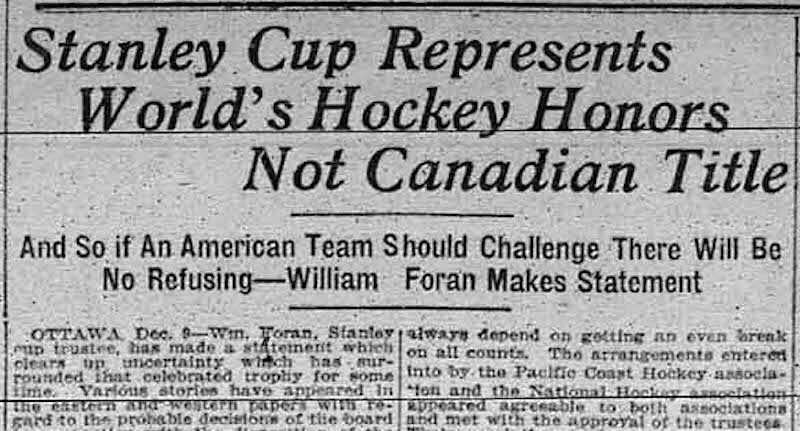 American teams have outnumbered Canadians ever since. In 1928, the New York Rangers became the NHL’s first American Stanley Cup champion and one year later, the Bruins defeated the Rangers in the first All-American Stanley Cup Final. 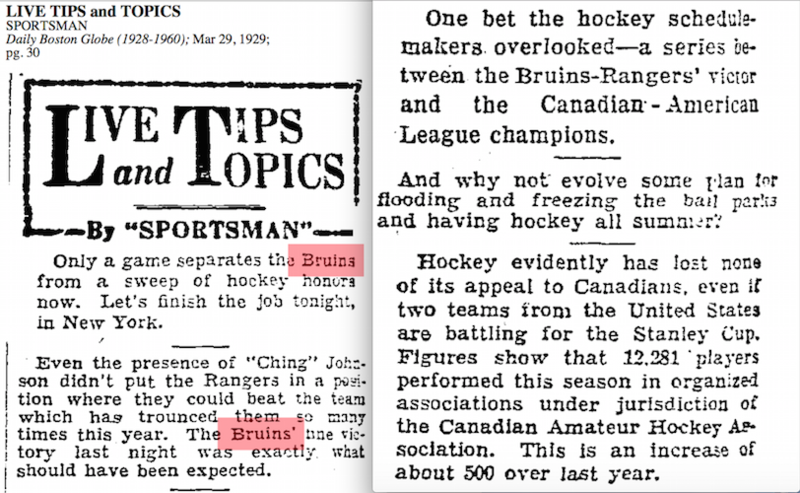 Sportswriters in American cities found the NHL’s protracted playoffs to be laughable, even in 1929 when Boston wrapped up the season on March 29. The Bruins had already beaten the Rangers to finish first in the American Division during the 1928-29 regular season, so why did they have to play them again for the Stanley Cup? This certainly didn’t happen in baseball, where only the first-place teams in the National and American leagues advanced to the World Series. Hmmm. Maybe the NHL has missed something by staging all those outdoor games in the dead of winter! Interesting as always, Eric. But what happened after 1993? You indicated that Canadian teams won the cup the majority of the time up to 1993, even though they were outnumbered. But that changed completely after 1993. Any thoughts on this modern drought? For a while, I think people blamed the lack of Stanley Cup success on the weak Canadian dollar. But I’m not sure that REALLY makes sense. (Though it certainly didn’t help!) As I was writing this story last night, I was starting to think that maybe it’s only the law of averages catching up. Given that Canadian teams have been outnumbered from 2-to-1 to 4-to-1 in the NHL since the 1940s, mathematically, they should only have won the Cup say, once every three years or less on average over the last 70+ years. So, really, that’s only about 20+ wins. So, in a sense, we’re still ahead of the game. It just doesn’t feel like it! Some further musing on the law of averages: Re the fact that Canadian teams comprise 7 of 30 NHL teams, or about 23 per cent. Let’s say 25 per cent to round it out. That means Canadian teams should win 1/4 of the time. But they have 0 cups since 1993, instead of 5 as they should statistically have. You’ve said, Eric, that this could be a statistical correction, based on the fact they outperformed in decades previously. However, they have reached the final 5 times since 1993, and 4 of those times went to seven games. And several Canadian teams have made the playoffs every year, notably Montreal and Ottawa. So they started out with the statistically expected result, they just stumbled at the finish line. But perhaps this is all the wrong approach. In the playoffs a small difference is usually the determining factor, especially since the salary cap system. So what is this difference in the final analysis? Do the American teams have slightly higher payrolls, despite the cap system, and is that really enough to win the Cup? Or is it something else? I’d hate to think that it’s too much pressure playing in Canadian cities where fans care so passionately! Has SIHR ever done a statistical analysis of payrolls of winning teams? There’s a very good article by James Mirtle of the Globe and Mail dated May 4, 2015, online, that addresses this issue. Not the payrolls per se, but the reasons for the decline. I’ll try to give the link here, but it might not work. Basically Mirtle discusses the rebuilding tactics of many of the teams and their results. It appears to have worked. Thanks! As much as I like hockey it is weird watching it in June!! Just saying…it isn’t like watching the Winter Olympics……hahahaa!! Thanks for sorting out our wins; it is good we are in essence ahead of the game!!! YAH!